It’s not very often that we talk about the sacroiliac joints (SI joints). These very important joints connect your spine to your pelvis. Run your fingers down to where your spine ends and there you’ll find a triangular-shaped bone called your sacrum. Below your sacrum rests your iliac bones—those large, flat bones that give the pelvis its distinctive shape. It’s here that your sacroiliac joints join these two bones. Unlike other joints, your SI joints don’t move much—there’s less than two millimeters of play between the joints and the bones they rest against—but they do carry a lot of weight. In fact, they support the entire weight of your upper body when you’re standing. This places a lot of strain on your SI joints, often leading to wear and tear of cartilage. Many people develop problems with their SI joints. Like your knees or hips, they are susceptible to becoming inflamed and causing pain. Your SI joints can also be strained if you’re standing for long periods during the day. Then you can develop what’s called sacroiliac joint dysfunction. This is a condition where your SI joints cease to function smoothly and painlessly. Most sacroiliac joint dysfunction is caused by degenerative arthritis. As was mentioned, the SI joints are cushioned with a cartilage layer. When this cartilage layer is broken down, your SI joints can’t do their job anymore. They’re no longer able to act as the shock absorbers between your sacrum and iliac bones. Osteoarthritis is the result. SI joint dysfunction can also happen during pregnancy. When a woman is preparing for childbirth, her body releases special hormones that help ligaments to relax. Once these ligaments relax, the SI joints can move around a lot more than they normally would. This, in turn, causes wear and tear on the joints. Pregnant women also adapt their walking style to accommodate the extra weight of a growing baby in their womb. This altered way of walking puts additional strain on the SI joints. Which brings us to another general cause of SI joint dysfunction: altering your walking pattern. What causes you to change your walking gait? For most, it’s the result of pain elsewhere in the body. When your knees hurt, you may develop a sort of shuffle to avoid increased pain when you walk. Everyone has experienced this on occasion after playing 18 holes of golf or spending the day on your feet, walking through a museum, for example. However, knee pain that triggers SI joint dysfunction is usually chronic, causing you to adapt your walking style over the long term. 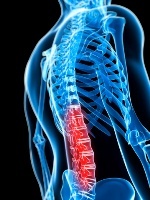 Chronic back pain can similarly affect your SI joints, causing them to not function properly. What can you do to relieve SI joint dysfunction? Try getting help from a physical therapist who can give you some stretching and strengthening exercises to perform. These exercises will be aimed at addressing whether there is too much movement or too little movement in your SI joints. Another alternative treatment you can try is yoga—click here for some safe yoga tips. Kamali, F., et al., “The effect of two manipulative therapy techniques and their outcome in patients with sacroiliac joint syndrome,” J Bodyw Mov Ther. January 2012; 16(1): 29-35. Yeoman, S.G., “Sacroiliac Joint Dysfunction (SI Joint Pain),” Spine health web site; http://www.spine-health.com/conditions/sacroiliac-joint-dysfunction/sacroiliac-joint-dysfunction-si-joint-pain, last accessed May 28, 2013.